A book by the fans, for the fans of Dragon Ball. Includes a lot of people who worked on Dragon Ball, notable names from the fan community, and the regular joe fans like myself. Trivia facts are included as well as stories from fans across the world. I too contributed a bit to this Genki-Dama book. By all means take a look. 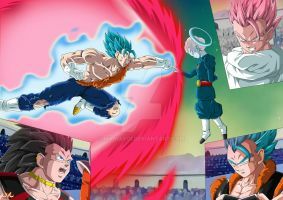 I am a dbz fan of course and I have been a huge fan since I was a little kid. I like mangas, video games, and shows that aren't on tv anymore. I occasionally make some images and chat once in a while. I'm mainly on Kanzenshuu so you can hit me up there or on my youtube. Favourite cartoon character: Goku, Gohan, Broly (M8), Vegetto, Freeza(Z Japanese, Kai Both), Super Boo, Mr. Satan, Beerus, Sonic, Tails, Eggman. Personal Quote: If you can't beat em, try Super Saiyan. Happy Early Birthday, hope it goes well. Yeah um, are you a kanzenshuu member too? Thank you for favoriting Blooper Saiyan!